On January 31, Taipei City Mayor Ko Wen-je oversaw the Taipei City African Swine Fever Prevention and Response Drill. Afterwards, he noted that if the African Swine Fever (ASF) were to enter Taiwan, it would have a huge impact on the country’s economy. As a busy international traffic hub, Taipei makes a plausible point of entry for the virus. Therefore, he exhorted the participating units to record any issues arising and to continue practicing the drill to achieve optimal readiness and response, and to prevent panic. Mayor Ko noted that the value of Taiwan’s annual pig production is NT$ 70 billion (USD 2.25 billion). When the value of pig feed and food processing is added to this, the total annual value of swine-related industry reaches approximately NT$ 200 billion (USD 6.5 billion). When ASF enters Taiwan, it usually cannot be solved within a year. Foot-and-mouth disease, for instance, required almost two decades to eradicate. If ASF virus were to impact Taiwan’s pig industry with its NT$ 200 billion annual output, the losses over several years would pose an immense threat to the industry. Therefore, this virus must be dealt with resolutely. He added that, due to the presence of international tourists, Taiwanese companies, and Mainland Chinese spouses, Taipei sees intensive international traffic flows, which make the city a rather plausible point of entry for the virus to enter Taiwan. 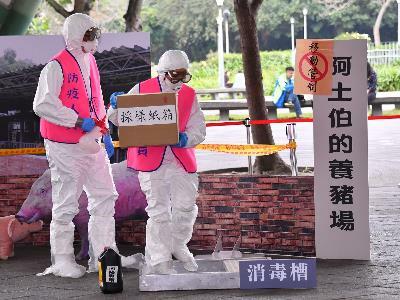 The city government therefore set up the Taipei City African Swine Fever Response Task Force on January 4, 2019. Since founding, the task force has met four times and drills have been held. Standard operating procedures for kitchen refuse handling, discoveries or outbreaks of ASF, and biosafety mechanisms have all been established. The mayor said that there are currently 11 sites within Taipei City that raise a total of 700 pigs, which accounts for about 0.01% of Taiwan’s pig population. Even if small, everything that can be done, must be done. Thus, Taipei has now banned the use of kitchen refuse in feeding hogs. Instead, they must be fed pig feed. He emphasized that today’s drill had uncovered some specialized issues that require further action, including the treatment of kitchen refuse and the disposal process for ASF-infected pigs (burial or incineration). These technical issues uncovered in the drill must be properly recorded and resolved, the mayor said, adding that drill must continue, so that all units are ready to handle an ASF outbreak should it occur, and prevent panic. Ko thanked the Animal Protection Office, Department of Environmental Protection, and other units of the Taipei City Government and the R.O.C. Army for their participation in the drill. He expressed his trust that the issues uncovered through the drill would be resolved as soon as possible.